Let's have a pint of (vim) ale! TL;DR: vim-ale is awesome and you should give a try! I’ve already blogged about linters and how I use them when I write Python code. I have a shell script call lint.sh which calls several linters. One for the style only, and several for static analysis. Note that the script runs the fast linters first (pycodestyle and pyflakes are pretty fast), and ends by running pylint, which can get pretty slow on big code bases. I type: :make when I’m done writing code. I use the quickfix window to fix lint errors. For me running pylint is as slow as running tests, and I’m used to have tests running synchronously too. We use eslint for code style, flow for type checking, and mocha plus chai for tests. And since we’re using GitLab for hosting our source code, we of course have a .gitlab-ci.yml file to run all of these for each merge request. At first I tried using the same work flow as with Python, but I quickly face some issues. For Neovim to populate the quickfix window, it has to parse the output of the linters programs. \ '%f:%l:%c: %trror: %m,' . \ '%f:%l:%c: %tarning: %m,' . Last but not least, all the linters ran quite fast (even flow, because it uses a background server under the hood). So it was also painful to have the editor unresponsive for the few seconds it took for all the linters to run. Then, look for files in the matching ale_linters folder to get a list of potential linters. Then, after a small time of inactivity (200ms by default), run all the linters found in the previous step, concurrently and in the background. Notice the red angle brackets in the column on the left, and the detailed message on the bottom. Also, by default the whole gutter will disappear when there’s nothing found by the linters, which allows you to instantly know you’re done fixing lint errors. There’s one location list per window, whereas the quickfix is global. I’ve heard about the location list for quite some time, but I’d never actually use it, so I was curious and wanted to know if it could fit in my workflow. I already used the quickfix window with :grep and other tools and I did not like having it replaced by vim-ale all the time. I use the Dvorak layout on my keyboard, and typing ln, lp or lr is much harder to type than cn, cp or cr there. Now, Neovim has this concept of “leader” key you can use to prefix all your custom mappings. I’m using “comma” for this, instead of the default (backslash), that I find hard to type. So of course I could have used a <leader> mapping for the location list command, but it unfortunately <leader>p, <leader>n, and <leader>r were already taken. Note: this means I can no longer easily use the space bar in normal mode, but by default all the space key does in move the cursor forward, so it’s not a big deal. 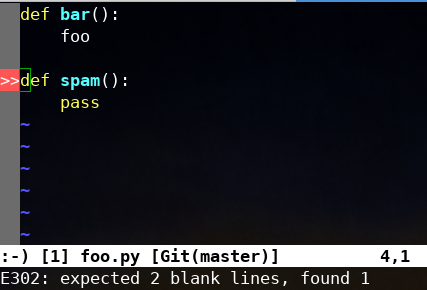 As I describer earlier, vim-ale is pretty smart, and comes pre-configured with the pylint and pyflake linters. This means that every time I was saving code in a Python file, vim-ale would find pylint and flake in the virtualenv or in the PATH, and run them with the default options. But by then I started to miss having the style being checked after each save. Unfortunately, vim-ale did not know about pycodestyle so I had to patch the code of the plug-in. You’ll notice everything is done with callbacks to get the path to the executable, the full command line, and how to parse the output. And here’s the implementation of the pycodestyle output parser. You’ll note it’s done by writing “real” code (it’s still vimscript, though) with helpers functions, instead of trying to set a weird errorformat option, with hard to read syntax. vim-ale requires very little configuration to work out of the box. The asynchronous features are really nice (and they work both in Neovim and Vim 8). It has tons of customization options, and last but not least, new linters are easy to add and customize.